Cambridge, Massachusetts: One night late in 1979, an itinerant young physicist named Alan Guth, with a new son and a year's appointment at Stanford, stayed up late with his notebook and equations, venturing far beyond the world of known physics. "SPECTACULAR REALIZATION," Guth wrote across the top of the page and drew a double box around it. On Monday, Guth's starship came in. Radio astronomers reported that they had seen the beginning of the Big Bang, and that his hypothesis, known undramatically as inflation, looked right. Reaching back across 13.8 billion years to the first sliver of cosmic time with telescopes at the South Pole, a team of astronomers led by John M. Kovac of the Harvard-Smithsonian Center for Astrophysics detected ripples in the fabric of space-time - so-called gravitational waves - the signature of a universe being wrenched violently apart when it was roughly a trillionth of a trillionth of a trillionth of a second old. They are the long-sought smoking-gun evidence of inflation, proof, Kovac and his colleagues say, that Guth was correct. Inflation has been the workhorse of cosmology for 35 years, though many, including Guth, wondered whether it could ever be proved. If corroborated, Kovac's work will stand as a landmark in science comparable to the recent discovery of dark energy pushing the universe apart, or of the Big Bang itself. It would open vast realms of time and space and energy to science and speculation. In our own universe, it would serve as a window into the forces operating at energies forever beyond the reach of particle accelerators on Earth and yield new insights into gravity itself. Kovac's ripples would be the first direct observation of gravitational waves, which, according to Albert Einstein's theory of general relativity, should ruffle space-time. According to inflation theory, the waves are the hypothetical quantum particles, known as gravitons, that carry gravity, magnified by the expansion of the universe to extragalactic size. "You can see how the sky is being distorted by gravitational waves," said Andrei Linde, a prominent inflation theorist at Stanford. "We are using our universe as a big microscope. The sky is a photographic plate." Marc Kamionkowski of Johns Hopkins University, an early-universe expert who was not part of the team, said, "This is huge, as big as it gets." "Although I might not fully understand it," Kamionkowski said, "this is a signal from the very earliest universe, sending a telegram encoded in gravitational waves." Kovac and his collaborators, working in an experiment known as BICEP, for Background Imaging of Cosmic Extragalactic Polarization, reported their results in a scientific briefing at the Center for Astrophysics here on Monday and in a set of papers submitted to The Astrophysical Journal. Kovac said the chance that the results were a fluke was only one in 3.5 million - a gold standard of discovery called five-sigma. Guth pronounced himself "bowled over," saying he had not expected such a definite confirmation in his lifetime. "With nature, you have to be lucky," he said. "Apparently we have been lucky." The results are the closely guarded distillation of three years' worth of observations and analysis. Eschewing email for fear of a leak, Kovac personally delivered drafts of his work to a select few, meeting with Guth, who is now a professor at MIT (as is his son, Larry, who was sleeping that night in 1979), in his office last week. "It was a very special moment, and one we took very seriously as scientists," said Kovac, who chooses his words as carefully as he tends his radio telescopes. Linde, who first described the most popular variant of inflation, known as chaotic inflation, in 1983, was about to go on vacation in the Caribbean last week when Chao-Lin Kuo, a Stanford colleague and a member of Kovac's team, knocked on his door with a bottle of Champagne to tell him the news. Confused, Linde called out to his wife, asking if she had ordered Champagne. "And then I told him that in the beginning we thought that this was a delivery but we did not think that we ordered anything, but I simply forgot that actually I did order it, 30 years ago," Linde wrote in an email. Calling from Bonaire, the Dutch Caribbean island, Linde said he was still hyperventilating. "Having news like this is the best way of spoiling a vacation," he said. Abraham Loeb, a Harvard-Smithsonian astronomer who was not part of the team, said: "It looks like inflation really took place. Since 1980, this was really speculative physics." Max Tegmark, a cosmologist at MIT, wrote in an email, "I think that if this stays true, it will go down as one of the greatest discoveries in the history of science." He added, "It's a sensational breakthrough involving not only our cosmic origins, but also the nature of space." Michael S. Turner, a cosmologist at the University of Chicago, hailed it as the kind of discovery that could lead eventually to resolving riddles like dark matter and dark energy, writing in an email, "I am starting to feel like a 20-something-year-old postdoc!" Lawrence M. Krauss of Arizona State and others also emphasized the need for confirmation, noting that the new results exceeded earlier estimates based on temperature maps of the cosmic background by the European Space Agency's Planck satellite and other assumptions about the universe. "So we will need to wait and see before we jump up and down," Krauss said. Corroboration might not be long in coming. The Planck spacecraft, which has been making exquisite measurements of the Big Bang microwaves, will be reporting its own findings this year. At least a dozen other teams are attempting similar measurements from balloons, mountaintops and space. Gravity waves are the latest and deepest secret yet pried out of the cosmic microwaves, which were discovered accidentally by Arno Penzias and Robert Wilson, both then at Bell Labs, 50 years ago. They got the Nobel Prize. Kovac has spent his whole career trying to read the secrets of these waves. 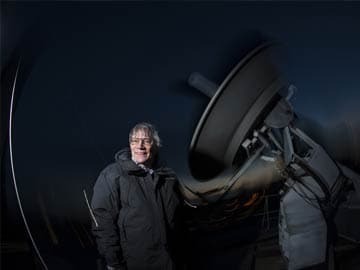 He is one of four leaders of BICEP, which has operated a series of increasingly sensitive radio telescopes at the South Pole, where the air - thin, cold and dry - creates ideal observing conditions. The others are Clement Pryke of the University of Minnesota, Jamie Bock of the California Institute of Technology and Kuo of Stanford. "The South Pole is the closest you can get to space and still be on the ground," Kovac said. He has been there 23 times, he said, wintering over in 1994. "I've been hooked ever since," he said. Detecting those spirals required measuring infinitesimally small differences in the temperature of the microwaves. The group's telescope, BICEP2, is basically a giant superconducting thermometer. "We had no expectations what we would see," Kovac said. The earlier Planck study had concluded that a parameter r, which is a measure of the swirliness of the polarization, could not be higher than 0.11, which would have knocked many popular versions of inflation. But it was not a direct measurement, as the BICEP team was attempting. The BICEP measurement of r clocked in at nearly twice that, 0.20, putting the most favored models back into contention. The data traced the onset of inflation to a time in cosmic history that physicists like Guth, staying up late in his Palo Alto house 35 years ago, suspected was a special break point in the evolution of the universe. Physicists recognize four forces at work in the world today: gravity, electromagnetism, and the strong and weak nuclear forces. But they have long suspected that those are simply different manifestations of a single unified force that ruled the universe in its earliest, hottest moments. As the universe cooled, according to this theory, there was a fall from grace, not unlike some old folk mythology of gods or brothers falling out with each other. The laws of physics evolved, with one force after another "freezing out," or splitting away. That was where Guth came in. Under some circumstances, a glass of water can stay liquid as the temperature falls below 32 degrees, until it is disturbed, at which point it will rapidly freeze, releasing latent heat in the process. Similarly, the universe could "supercool" and stay in a unified state too long. In that case, space itself would become temporarily imbued with a mysterious kind of latent heat, or energy. Inserted into Einstein's equations, the latent energy would act as a kind of antigravity, and the universe would blow itself up. Since it was space itself supplying the repulsive force, the more space was created, the harder it pushed apart. In a runaway explosion, what would become our observable universe mushroomed in size at least a trillion trillionfold - from a submicroscopic speck of primordial energy to the size of a grapefruit - in less than a cosmic eye-blink. Almost as quickly, this energy would decay into ordinary particles and radiation that were already in sync, despite how far apart they wound up, because they had all sprung from such a tiny primordial point, as if the galaxies had gotten together in the locker room to make a plan before going out. All of normal cosmic history was still ahead, resulting in today's observable universe, a patch of sky and stars 14 billion light-years across. "It's often said that there is no such thing as a free lunch," Guth likes to say, "but the universe might be the ultimate free lunch." Make that free lunches. Most of the hundred or so models that have been spawned by Guth's original vision suggest that inflation, once started, is eternal. Even as our own universe settled down to a comfortable homey expansion with atoms, stars and planets, the rest of the cosmos will continue blowing up, spinning off other bubbles here and there endlessly, a concept known as the multiverse. The BICEP data does not reveal what this magical-sounding inflating energy is. Antigravity might sound crazy, but it was Einstein who first raised the possibility of its permeating space in the form of a fudge factor called the cosmological constant, which he later abandoned as a blunder. It was revived with the discovery 15 years ago that something called dark energy is giving a boost to the expansion of the universe, albeit far more gently than inflation did. As Guth will be the first to say, we might never know what happened before inflation, at the very beginning, because inflation erases everything that came before it. All the chaos and randomness of the primordial moment are swept away, forever out of our view. "If you trace your cosmic roots," Loeb said, "you wind up at inflation."